The tomb of the great Iranian scientist, Avicenna, is in Hamadan with a building and dome built in 1954. The design of the dome is inspired by the shape of Ghaboos Voshmgir Tower. There is a library with a number of manuscripts in this building. 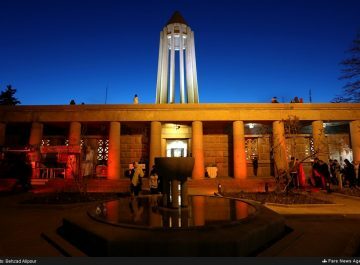 In the courtyard of the building, there is a tomb belonging to the late Qajar period poet and songwriter Abolghassem Aref.